At around 7-8 years ago, a few extra classrooms were constructed in my school because of sudden increase in the number of students. There were four classrooms that were constructed in the old school building: classroom A to D.
Classrooms A, B and C were constructed without any problem, but it was the classroom D that made its construction seem impossible. Some people who were involved in the construction got injuries, while some other people died of unknown causes. Moreover, a lot of strange incidents occurred during the process. The classroom construction somehow got finished. But even then, the mysterious incidents continued to occur---even during the lectures. One week after the lectures had started, a D classroom teacher suffered a heart attack in the middle of the lecture. One week after that, the teacher passed away. Even the other Teachers that taught after the incident ended up hospitalized for one reason or the other. After that, the people who used to say "It was all a coincidence", started believing that something was ominous about that classroom. Everyone was scared. Also, the classroom was allotted to new students every year. Every year, one student died from that group of new students. Because of that, the students started calling it "The Devil's Classroom" out of hate. Spring came and classrooms were reshuffled. Classrooms allotment was pasted on the notice-board. I walked towards the notice-board to take a look. In front of the notice-board, I saw Yasuda-kun. He was staring at the notice-board with a pale face. "What's the matter, Yasuda-kun?,"I asked. 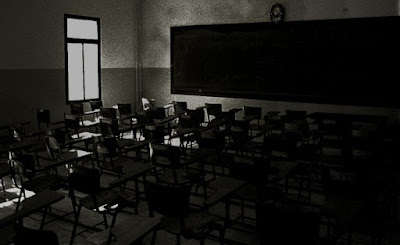 He replied with a jittery voice, "....The devil's...classroom..."
He pointed at his name on the notice-board. In fact, his name was written under classroom D's students---he was now a student of 'The devil's classroom!'. "You don't have to worry about it, "I said to him while patting on his shoulder. I looked at the notice board more carefully, and I saw that even my name was under classroom D's students. ".........I'm also in classroom D...," I said. "I had been thinking that I might get allotted to class D because my luck is quite bad. And it turned out the same way," He replied. "That just your imagination. Even I, who thought that my luck was quite good, got allotted to class D. We cannot blame everything on luck. Our allotment depended solely on probability. That's how it is. ", I stated my opinion. "Conversely, if you think about it, then Picking the unlucky number can also be possibly linked with a stronger luck. ", I said. "....Nakagawa-san, you're a happy-go-lucky person. I'm the type of person who's always been getting the unlucky number, right from my childhood. But, I never thought that it could be because of having a stronger luck. ", He said. "I can understand it. It will hit me again this time. From the lot of classroom's D sacrificial victims, I will be the one who'll get picked this time. ", He said. "You're overthinking it! ", I replied. "At the start of this year, I picked my fortune strip at the shrine. It read 'terrible'. I picked another one again. It still read 'terrible'. No matter how many times I picked a new one, but it read 'terrible' only. This year, I'm the one who's going to die by the D class' curse! ", He said with a scared face. "They were all coincidences. ", I tried to reassure him. "You can say that because you are an easy going person. ", He replied back to me. For some reason, I was now irritated with him. "Yeah! that's it. I have a good luck because I don't think about bad things. ", I shouted at him. "I've picked the unlucky number again...", He repeated that again with his pale face. This was the last time, I saw Yasuda-kun. He got run over by a truck that day. When I received the message about Yasuda-kun's death, I was like "Just as I thought." He was the unlucky one to be chosen this year. After that, just like humans do, people slowly and slowly forgot about Yasuda-kun's death, and then everything returned to normal life. Yes, I was also among those people. By the way, 3 days ago, I was returning to home from school, and when I turned at the corner of the main street, I saw Yasuda-kun. He was carrying his school bag and was walking in front of me. He was Yasuda-kun for sure. I called "Yasuda-kun" and asked him to stop. But the moment I called him, he ran away at full speed. I, for some reason, chased him in a daze. "WATCH OUT!" I felt like I heard a voice from behind. And then, the sound of car brakes echoed through my head. I see all the teachers that died due to classroom D. They are teaching in the classroom. I look back and see that Yasuda-kun is sitting on the desk behind me and listening to the lectures. I look around at the classroom and see the man who worked and died in the construction process. I also see a lot of people who are clinging to the walls of this classroom. I see an old cemetery in the classroom. Today, I saw that my desk was decorated with flowers. I did forget an important thing. Yasuda-kun never attended the D classroom. He died before it. This year's victim of D class was not him, but me. Phew! This story took a long time to translate. Around 2+ hours. I might translate the other gakkou no kaidan stories in the future. Otsukaresama! 2 hours was a long time, but I know you were enjoying the translating ^^ I only play the Nanashi No Geemu, because it has english patch haha. By the way, this story is very popular in Japan. Like cursed construction of building or else. In my country there are some building left unfinished, but people deny the mysterious cause of it. They always say that it is because of lack in the fund raising or such. This story is very frightening, because the one who always has good luck can not even escape from the cursed situation. And the one died in classroom D, stays in the classroom D.
Very scary because even you have died, you forever belong to classroom D.
amazing series. The first game is a lot better than the second. That game has become my all time favorite horror game. Japan really loves creating cursed stories about apartments, trees, mountains, streets, schools, hospitals and whatnot. It could be because of lack of funds, but the abandoned buildings do look creepy, even if nothing happened in them. I read a story about how the construction of an apartment stopped in between and it was then turned into a park. It was a creepy story. Will translate it sometime. The narrator of this story was quite confident in himself even then he couldn't escape the classroom's curse. That classroom is cursed for sure. Everyone who dies becomes confined in the classroom forever. Another? I love that anime. I remember it also had the cursed classroom theme. Yeah, where the curse will kill one student each month. Usually in brutal ways. Anyway, you are a good translator. Keep up the good work! What is Gengar's real identity? Japanese Cryptic: Help! Son is going to kill me!